Hello My name is Joe Hawhee. I have been around horses and livestock all my life. I grew up raising horses, cattle, sheep, hogs, and chickens. For years I worked various jobs (I'm most happy when I'm making somthing). I even did a stint in the U.S. Air Force. In 1995 I went to Fred Harrsants saddle and tree making school. 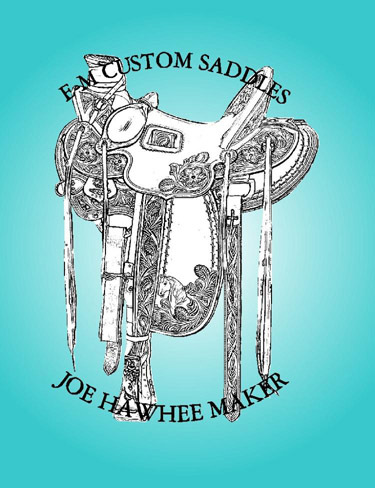 I've been designing and creating saddles since 2001. I became the exclusive saddle maker for Sullivans Saddlery from 2006 till 2017, when unfortunatley we lost Jim (Bubb) Sullivan. With each new saddle I build or repair I learn something new. I take this knowledge and apply it to the next saddle I make. Sometimes the lessons come slowly and sometimes they come in great big heaps, I just never know what I'm going to findout next. I look forward to what I'll learn while building your custom saddle. I make various tack and western related items, from custom chinks & chaps, to spur straps, headstalls, bucking rolls, duck straps & even purses. Each item is designed (with your input of course) & hand tooled by me, but the thing I enjoy most, the thing that brings me the most satisfaction is making saddles. I am first & formost a saddle maker. Every saddle is hand made. I use the best materials available. Herman Oak leather and Quality Brand Trees. Herman Oak leather is an American leather tanned in St. Louis Mo. Quality Brand trees are hand made in Monticello Utah. These are wood trees covered in rawhide. I don't believe there has ever been a stronger more durable material for making saddle trees. Please call for a quote on your new saddle today. You can reach me through﻿ E-mail, Facebook or phone.